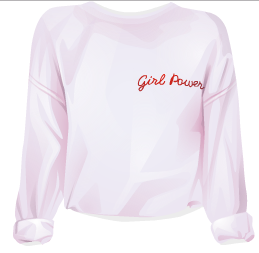 Today we have a new Hotbuys release, which is Original Future Girl Power Sweatshirt. The shirt itself looks alright, but I wouldn't ever buy it for 21sd because that's just not worth it. Not sure why everything seems to be getting so expensive while looking pretty average. I like the graphics, the item is neat, maybe a bit bleak but that's totally fine, and there really isn't much bad I can say because it's a fairly decent item, in my opinion. But as I've said it before, you guys are the best judges, and therefore, let me know what you think down in the comments. Even though the shirt is not my favourite item ever, I felt a bit inspired to do a "my way". What are your thoughts on this new Hotbuys release?